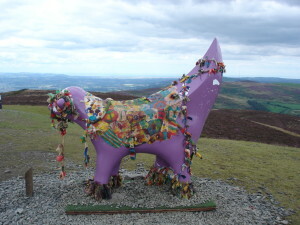 As part of Liverpool 08 Capital Of Culture, themed copies of the original Superlambanana statue have been placed in various location around Liverpool, Wirral (at Ness Gardens) and even at Moel Famau (pictured). Typically, Superlambanana attracts both acclaim and derision in equal measure so there’s been a mixed reaction to this highest of Superlambananas! to celebrate the connections between the Clwydian Range AONB and Merseyside, the walk will see Wales holding its own celebration as Liverpool commemorates its status as European Capital of Culture.